China's grandest annual celebration, Spring Festival otherwise known as Chinese Lunar New Year, has in recent years become an occasion to celebrate the country's rich culture by the entire world. We are entering the Year of the Pig, completing the 12-year cycle of the Chinese Zodiac, representing the Twelve Earthly Branches, and said to determine the character and fortune of a person born in a particular year. Since ancient times the Chinese zodiac, with its rich history and mythology, has shaped the nation's traditional culture and distinguished it from the rest of the world. Although the Gregorian calendar is now widely used in China, the old system known as "Shuxiang" is still popular and of great significance in people's lives. The Year of the Pig begins on February 5, 2019, and will last until January 24, 2020. The chubby pig is a well-liked animal for Chinese people, who regard it as a symbol of wealth, good fortune and prosperity. 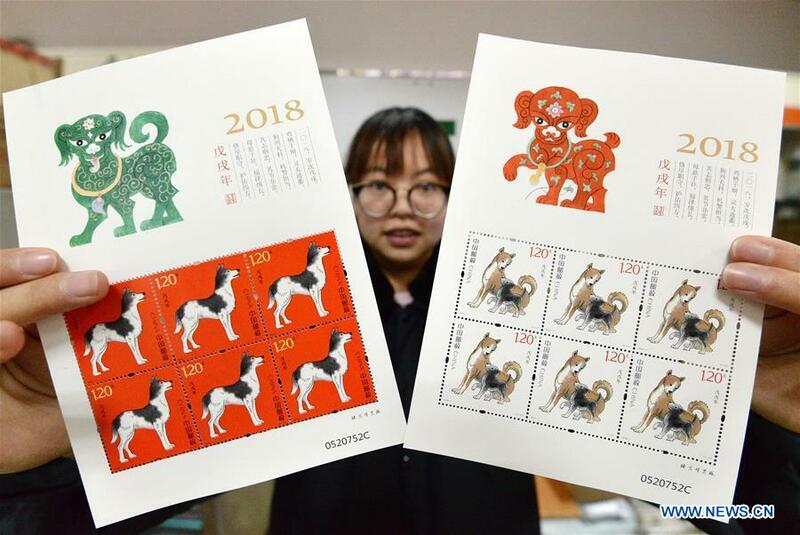 It has also become a Chinese tradition to issue commemorative zodiac stamps on January 5 ahead of a new lunar year, which is a must-have item for domestic philatelists. This time, China Post issued a set of two special zodiac stamps, featuring the Pig; each stamp with a nominal value of 2.4 yuan (US$0.3446). The designs, namely "Pig Brings You Blessings" and "Five Blessings Gathering", created by Han Meilin, a veteran craft artist and professor at Tsinghua University, symbolize the beautiful and good life, expressing the best wishes for family reunion in the New Year. Chinese stamp collectors and even ordinary people went crazy buying up the new stamps as soon as they appeared, as they are the last zodiacal stamps in the current 12-year set. China started issuing stamps featuring one of the 12 zodiac animals before every Spring Festival from 1980. Famous Chinese painter Huang Yongyu designed the image for the first monkey stamp to be issued then, nicknamed "red monkey." China has now issued zodiac stamps for 40 consecutive years so that people can use new stamps in their correspondence in the days leading up to the Lunar New Year. It is a major source of pride that the Chinese zodiac stamps symbolize the long history of Chinese culture and are now helping the world develop a deeper understanding of it. More importantly, the issuance of Chinese zodiac postal stamps has a special significance in recording China's landmark changes after 40 years of the reform and opening-up program. In the Year of Monkey of 2016, for example, China formally ended three decades of population control known widely as the "one-child policy," allowing all couples to have two children. To mark that occasion, stamp designer Huang Yongyu constructed the image of cartoon monkey being kissed by not one but two baby monkeys, symbolizing a bigger happy family. Last year, China Post issued special zodiac stamps in the Year of Dog designed by the well-known artist Zhou Lingzhao. The stamps he created were seen as a bringer of good luck and prosperity to ordinary Chinese people, a part of "Chinese Dream" to create a moderately prosperous society by 2020. The animal-themed stamp collections are not only issued in China, but also in many other countries, such as the United States, Australia, Canada, New Zealand, South Korea, Singapore, Malaysia, the Philippines, to name a few who think it appropriate to celebrate the Chinese lunar calendar. The UN Postal Administration, for example, issued a special stamp sheet featuring the Year of the Pig on January 15. La Poste, the National Postal Service of France has been issuing stamps of Chinese zodiac animals for more than 10 years to symbolize the good relations between the two countries. 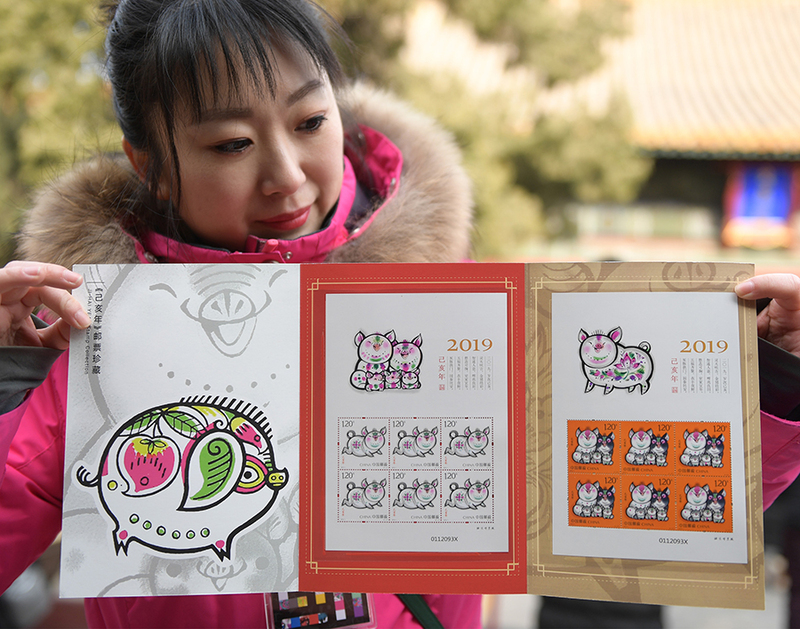 La Poste issued two sets of stamps commemorating the Year of the Pig on January 28. The zodiac animals are part and parcel of Chinese history and culture. They usher in a blissful lunar new year with their symbolic meanings. To celebrate the Chinese Lunar New, artists in China and the world have drawn many different representations of zodiac animals through elegant stamps, which symbolize the rejuvenation of China and seek to strengthen friendship between nations. Wishing everyone a happy Chinese New Year of the Pig!